United States Joint Forces Command, Joint Operating Environment (JOE) report February 18, 2010. While the report is more expansive than the OSS coverage, we highlight a few segments including trends, demographics, economics, energy and climate change factors. Over the next quarter century, U.S. military forces will be continually engaged in some dynamic combination of combat, security, engagement, and relief and reconstruction. There will continue to be those who will hijack and exploit religion for extremist ends. There will continue to be opponents who will try to disrupt the political stability and deny the free access to the global commons that is crucial to the world’s economy. In this environment, the presence, reach, and capability of U.S. military forces, working with like-minded partners, will continue to be called upon to protect our national interests. Merely sustaining the health of the Joint Force, never mind adapting and transforming, is far more complicated in a period of persistent conflict, with its toll on equipment, people, and national will. Trend analysis is the most fragile element of forecasting. The world’s future over the coming quarter of a century will be subject to enormous disruptions and surprises, natural as well as man-made. These disruptions, and many other contiguous forces, can easily change the trajectory of any single trend. The Joint Operating Environment recognizes that many, if not all, of the trends and trajectories of the future will be non-linear. For the purpose of analysis, however, it has used a traditional approach to examine many of the trends and utilized conservative estimates. Economic estimates rest on trend lines easily disputed both in the present and the future. In 1928 most economists would have given far rosier prospects for the American and world economies. Four years later, they would have given a far darker picture. That is the nature of change in economics as well as in every other human endeavor. Wide variations in either direction are not just feasible – they are likely. Nevertheless, the long-term strategic consequences of the current financial crises are likely to be significant. Over the next several years a new international financial order will likely arise that will redefine the rules and institutions that underpin the functioning, order, and stability of the global economy. There is one new watchword that will continue to define the global environment for the immediate future: “interconnectedness.” Until a new structure emerges, strategists will have to prepare to work in an environment where the global economic picture can change suddenly, and where even minor events can cause a cascading series of unforeseen consequences. A good place to begin the discussion of trends is demographics because what is happening demographically today, unless altered by some catastrophe, has predictable consequences for the populations of regions and states. Equally important, it possesses implications for future strategic postures and attitudes. 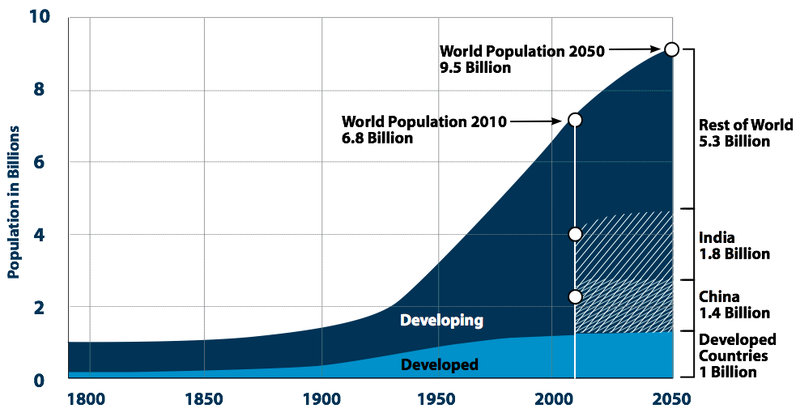 In total, the world will add approximately 60 million people each year and reach a total of 8 billion by the 2030s. Ninety-five percent of that increase will occur in developing countries. The more important point is that the world’s troubles will occur not only in the areas of abject poverty but also, to an even greater extent, in developing countries where the combination of demographics and economy permits populations to grow, but makes meeting rising expectations difficult. Here, the performance of the global economy will be key in either dampening down or inflaming ethnically or religiously based violent movements. For the most part, the developed world recognizes that it has a major stake in the continuing progress of globalization. The same can be said for those moving into the developed world. Nevertheless, one should not ignore the histories and passions of popular opinion in these states as they make their appearance. One should not confuse developed world trappings for underlying stability and maturity of civil societies. A more peaceful, cooperative world is possible only if the pace of globalization continues. In particular, this means engaging China and other nations politically and culturally as they enter into the developed world. The country faces a fundamental disconnect between the services people expect the government to provide...and the tax revenues that people are willing to send to the government ... The fundamental disconnect will have to be addressed in some way if the budget is to be placed on a sustainable course. The precise nature of a “hard landing” of this sort is difficult to predict should creditor nations such as China demand higher interest rates, increasing the perception that the U.S. no longer controls its own financial fate.16 This dynamic could encourage the establishment of new reserve currencies as global economic actors search for alternatives to the dollar. Changing conditions in the global economy could likewise have important implications for global security also, including a decreased ability of the United States to allocate resources for defense purposes, less purchasing power for available dollars, and shifting power relationships around the world in ways unfavorable to global stability. 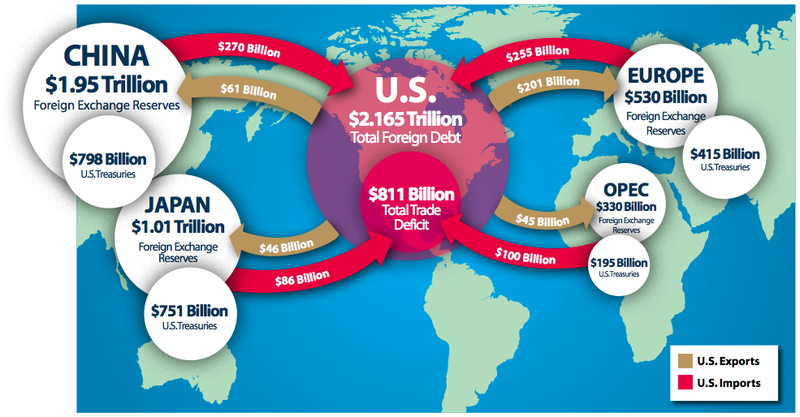 Domestically, the future of the U.S. financial picture in both the short and long term is one of chronic budget deficits and compounding debt. The federal deficit for the 2009 fiscal year was about $1.42 trillion or one tenth of U.S. economic production in that year. For the first two months of the 2010 fiscal year, the cumulative deficit was already higher than any previous total yearly deficit run by the federal government and even the most optimistic economic projections suggest that the U.S. will add $9 trillion to the debt over the next decade, outstripping even the most optimistic predictions for economic growth upon which the federal government relies for increased tax revenue. The graph above illustrates the scale of this shortfall between government spending and available revenue – a shortfall unprecedented since the end of the Second World War. Although these fiscal imbalances have been severely aggravated by the recent financial crisis and attendant global economic downturn, the financial picture has long term components which indicate that even a return to relatively high levels of economic growth will not be enough to right the financial picture. The near collapse of financial markets and slow or negative economic activity has seen U.S. Government outlays grow in order to support troubled banks and financial institutions, and to cushion the wider population from the worst effects of the slowdown. These unfunded liabilities are a reflection of an aging U.S. Baby-Boom population increasing the number of those receiving social program benefits, primarily Social Security, Medicare, and Medicaid, versus the underlying working population that pays to support these programs. Rising debt and deficit financing of government operations will require ever-larger portions of government outlays for interest payments to service the debt. 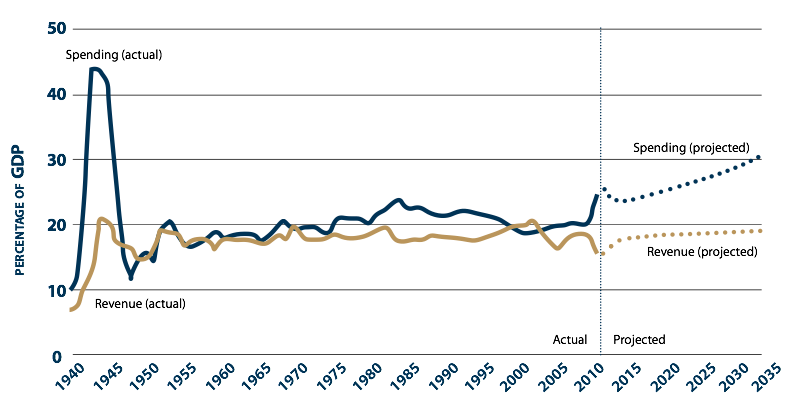 Indeed, if current trends continue, the U.S. will be transferring approximately seven percent of its total economic output abroad simply to service its foreign debt.18 As the graph above illustrates, interest payments are projected to grow dramatically, further exacerbated by recent efforts to stabilize and stimulate the economy, far outstripping the current tax base shown by the black line. Interest payments, when combined with the growth of Social Security and health care, will crowd out spending for everything else the government does, including National Defense. The impact of climate change, specifically global warming and its potential to cause natural disasters and other harmful phenomena such as rising sea levels, has become a concern. Scientific conclusions about the potential effects of climate change are contradictory, with some arguing that there will be more and greater storms and natural disasters: others, that there will be fewer. Climate change is included as one of the ten trends most likely to impact the Joint Force. For example, sea ice has been shrinking dramatically in Arctic regions each summer, and in the future this could open new shipping routes across archipelagic Canada and Northern Russia that could dramatically shorten transit times between Europe and Northeast Asia. Furthermore, shrinking sea ice opens new areas for natural resource exploitation, and may raise tensions between Arctic nations over the demarcation of exclusive economic zones and between Arctic nations and maritime states over the designation of important new waterways as international straits or internal waters. As an early move in this new competition, in 2007 two Russian submersibles made an unprecedented dive 2.5 miles to the arctic sea floor, where one ship dropped a titanium capsule containing a Russian flag. Retreating ice creating access to previously unavailable natural resources is but one example of potential security challenges that did not exist in the past. Global sea levels have been on the rise for the past 100 years. Some one-fifth of the world’s population as well as one-sixth of the land area of the world’s largest urban areas are located in coastal zones less than ten meters above sea level. Furthermore, populations in these coastal areas are growing faster than national averages. In places such as China and Bangladesh, this growth is twice that of the national average.23 Should global sea levels continue to rise at current rates, these areas will see more extensive flooding and increased saltwater intrusion into coastal aquifers upon which coastal populations rely, compounding the impact of increasing shortages of fresh water. Additionally, local population pressures will increase as people move away from inundated areas and settle farther up-country. In this regard, tsunamis, typhoons, hurricanes, tornadoes, earthquakes and other natural catastrophes have been and will continue to be a concern of Joint Force commanders. In particular, where natural disasters collide with growing urban sprawl, widespread human misery could be the final straw that breaks the back of a weak state. Furthermore, if such a catastrophe occurs within the United States itself - particularly when the nation’s economy is in a fragile state or where U.S. military bases or key civilian infrastructure are broadly affected - the damage to U.S. security could be considerable. Areas of the U.S. where the potential is great to suffer large-scale effects from these natural disasters are the hurricane- prone areas of the Gulf and Atlantic coasts, and the earthquake zones on the west coast and along the New Madrid fault. In the 2030s, as in the past, the ability of U.S. military forces to relieve the victims of natural disasters will impact the reputation of the United States in the world. For example, the contribution of U.S. and partner forces to relieve the distress caused by the catastrophic Pacific tsunami of December 2004 reversed the perceptions of America held by many Indonesians. Perhaps no other mission performed by the Joint Force provides so much benefit to the interests of the United States at so little cost. Absent a major increase in the relative reliance on alternative energy sources (which would require vast insertions of capital, dramatic changes in technology, and altered political attitudes toward nuclear energy), oil and coal will continue to drive the energy train. 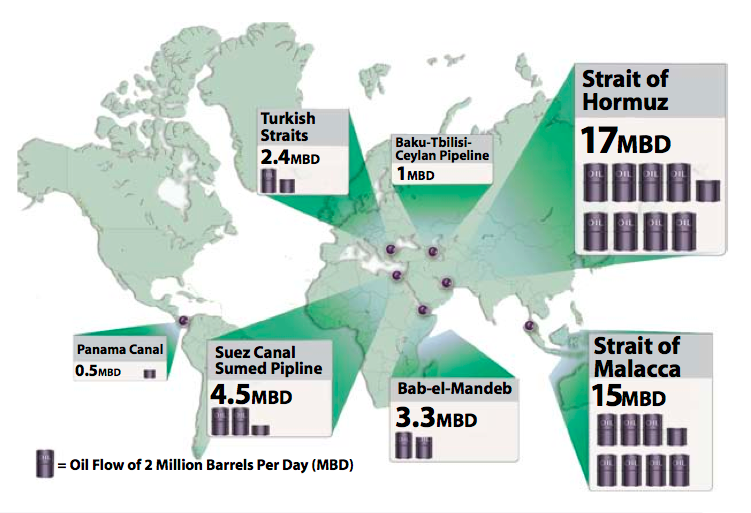 By the 2030s, oil requirements could go from 86 to 118 million barrels a day (MBD). Although the use of coal may decline in the Organization for Economic Cooperation and Development (OECD) countries, it will more than double in developing nations. 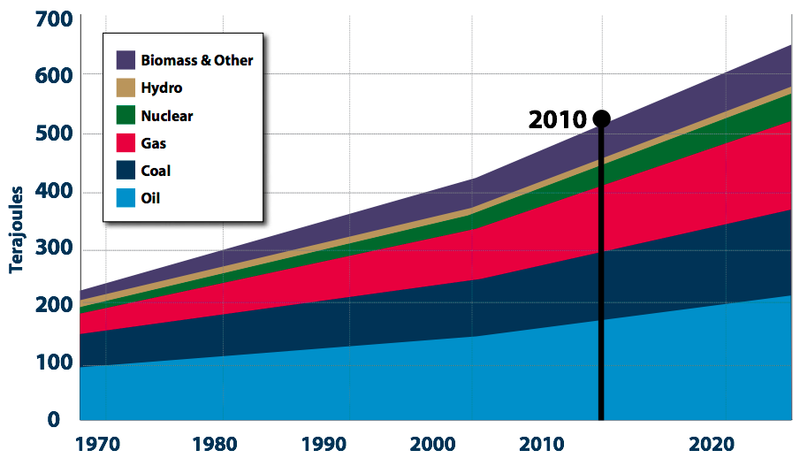 Fossil fuels will still make up 80% of the energy mix in the 2030s, with oil and gas comprising upwards of 60%. The central problem for the coming decade will not be a lack of petroleum reserves, but rather a shortage of drilling platforms, engineers and refining capacity. Even were a concerted effort begun today to repair that shortage, it would be ten years before production could catch up with expected demand. The key determinant here would be the degree of commitment the United States and others display in addressing the dangerous vulnerabilities the growing energy crisis presents. That production bottleneck apart, the potential sources of future energy supplies nearly all present their own difficulties and vulnerabilities. None of these provide much reason for optimism. At present, the United States possesses approximately 250 million cars, while China with its immensely larger population possesses only 40 million. To generate the energy required worldwide by the 2030s would require us to find an additional 1.4 MBD every year until then. 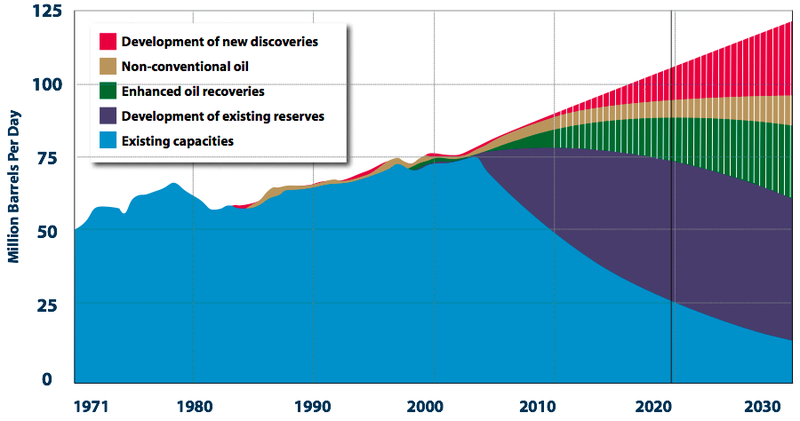 During the next twenty-five years, coal, oil, and natural gas will remain indispensable to meet energy requirements. The discovery rate for new petroleum and gas fields over the past two decades (with the possible exception of Brazil) provides little reason for optimism that future efforts will find major new fields. At present, investment in oil production is only beginning to pick up, with the result that production could reach a prolonged plateau. By 2030, the world will require production of 118 MBD, but energy producers may only be producing 100 MBD unless there are major changes in current investment and drilling capacity. Energy production and distribution infrastructure must see significant new investment if energy demand is to be satisfied at a cost compatible with economic growth and prosperity. Efficient hybrid, electric, and flex-fuel vehicles will likely dominate light-duty vehicle sales by 2035 and much of the growth in gasoline demand may be met through increases in biofuels production. Renewed interest in nuclear power and green energy sources such as solar power, wind, or geothermal may blunt rising prices for fossil fuels should business interest become actual investment. However, capital costs in some power-generation and distribution sectors are also rising, reflecting global demand for alternative energy sources and hindering their ability to compete effectively with relatively cheap fossil fuels. Fossil fuels will very likely remain the predominant energy source going forward.